MJ Agenda is a live daily 30-minute podcast of marijuana related news. The Marijuana Agenda is a daily podcast dedicated to informing and entertaining listeners on the need to end adult cannabis prohibition. In the face of a renewed political threat to marijuana law reform, it is incumbent that all aspects of the marijuana movement - medical cannabis, adult marijuana, industrial hemp, and spiritual ganja - band together to face our common enemies that fight to maintain cannabis prohibition worldwide. Executive Producer and Host Russ Belville brings you regular segments featuring the leadership of the non-profit organizations lobbying to reform marijuana laws, investors and entrepreneurs behind the cannabis green rush, and the researchers and analysts to help us make sense of it all. The Marijuana Agenda also includes the days latest cannabis headlines and data points, plus Belville's trademark "Radical Rant" opinion pieces. 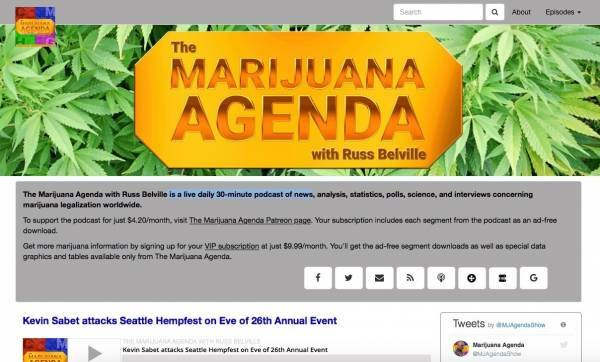 Russ Belville is a veteran marijuana activist and cannabis journalist with over 4,000 podcast hours and 1,000 published articles to his credit. His writing appears regularly in print and online with HIGH TIMES, in the SF Chronicle's Green State website, and on the reform blog Weed News.